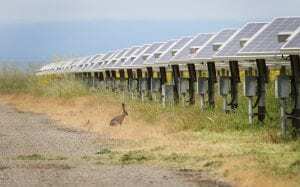 A jackrabbit on a site outside California’s urban Bay Area takes a peak at the camera before taking cover between the solar tracker rows. Photo by RPCS. When responsibly and sustainably developed, large-scale PV projects can provide shelter for sensitive species, promote land stability, preserve habitat, and support biodiversity, creating sanctuary for plant and animal life while creating coexistence between the solar site and flora and fauna. Solar energy has proven to be one of the cleanest, cheapest, and most abundant energy sources available today, and is highly effective at eliminating leading factors that contribute to our warming planet. RP Construction Services (RPCS) is in the business of solar site construction and solar tracker installation on sites ranging from 2MW to 100MW. In each of my visits to one of our sites, I never fail to spot some incredible wildlife. From horned lizards to pronghorn antelope, I’ve seen an array (pun intended) of both plant and animal life in and around our solar sites—and both seem to be thriving. I decided to do some thorough research on the topic, and this article presents my findings. 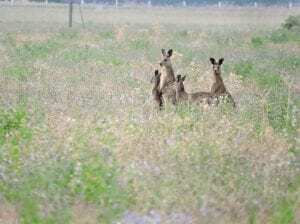 A family of kangaroos on a solar farm in Australia. Image courtesy Array Technologies. The construction of a solar site can cause short-term disturbance to the local environment—including factors such as noise, site grading, greenhouse gas emissions, soil erosion, and compaction from heavy equipment used to construct the arrays. However, these are only temporary impacts and can be minimized through careful planning and execution. Comparatively, solar site construction is not nearly as destructive as other types of large-scale energy construction or extraction projects—coal extraction, surface mining, and oil drilling are a few examples. Nevertheless, once the site is constructed, solar energy is completely free, produces no pollution, no emissions, and no noise, which means generating solar power produces no carbon footprint. Solar also uses zero water per megawatt hour to operate, compared to a coal plant’s 1,100 gallons per megawatt hour, nuclear’s 800 gallons, and natural gas’s 300 gallons.